These elegant poppies just cried OUT for watercolor! And in this video I’ll show you how to do kind of a cheater “loose” style….it’s fun and isn’t as out of control as you’d worry it might be! Watch the video below or click HERE to see it in HD on YouTube. The card front is layered onto black, then the pink card base, setting it off nicely. One flower was masked for the stamping of the sentiment “HAPPY”….I didn’t have the right color pink ink, so used some red with some Picked Raspberry on top of it to get close to it! SO PRETTY!!! WHAT A GREAT CARD!! Hmmm – the link to the poppy Stamp gets a 404 error…. You know i do love your watercolour painting & I’m so happy you are going to do a watercolour jumpstart class. Happy, happy, happy, thank you. Your card of poppies is brilliant & I thought it would make a gorgeous framed art piece. Absolutely gorgeous! I, for one, could just watch you paint(quite beautifully) & listen to you talk for ever. EVERYTHING you do amazes me! You are so very talented! Thanks for sharing and your explanation I have a real issue with poppies and have been trying them with watercolour for a while will give it another try now. Thanks again. I admire your watercolouring always and love it so much but watercolour and me doesn’t go together altough I lately try to work with my Zigs and water. And just what you say…practice, practice. Thank you Sandy for again a great card! I love that you mention “water management “ in your upcoming class. That’s definitely what I need to work on! Thanks, Sandy! 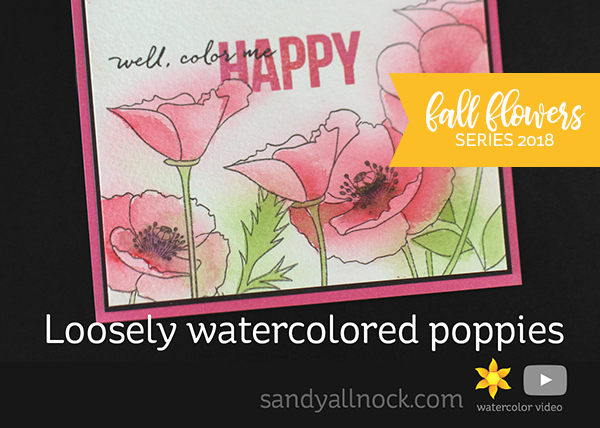 Ooooo love these poppies and the soft look of your watercoloring. Love your card, such pretty soft colors. Thank you for your tips and your video. Awesome loose coloring +. Love how you make the magic happen thanks for the video!